I have often said that sea vegetables are criminally underrated. Like their terrestrial brethren, they offer significant nutrition, but sea vegetables also provide the same omega-3 fatty acids found in fish (where else do you think fish get their omega 3s from?). 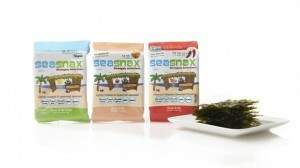 A few months ago, I came across SeaSnax, a roasted seaweed snack cooked in olive oil (most varieties contain sesame oil; while not a terrible oil, it lacks the heart-healthy monounsaturated fats of olive oil). Available in plain, onion, chipotle, and wasabi flavors, this is a delicious, crunchy, GMO-free snack (or a great addition to soups and salads) with a simple ingredient list. Since I love to share my must-have staples, here is your chance to win a case. One winner will get a choice of a dozen Grab & Go’s (any flavor) or 4 packs of full sheet singles (any flavor). As regular Small Bites readers know, I am a vocal fan of sea vegetables. They are highly anti-inflammatory, a good source of omega 3 fatty acids not found in other plant-based foods, and offer a nice array of vitamins, minerals, and other healthful compounds. Alas, since sea vegetables are not a part of traditional North American cuisine, most of us did not grow up eating them, or perhaps even knowing what they looked and tasted like. Except for some offerings at Japanese restaurants (maki rolls with nori, seaweed salads, and miso soup with a few bits of seaweed), our exposure to all this great underwater produce is rather limited. You can purchase sea vegetables at health food stores, Asian markets, Whole Foods, or through websites like Maine Coast or Eden Foods. Keep in mind that you are buying dried sea vegetables, most of which you will then rehydrate at home. Sea vegetables expand quite a bit after being soaked (as much as five times their dried size), and these recipes don’t call for large amounts anyhow. You are getting a lot more food for your money than you may originally think. In terms of flavors, arame and wakame are milder, hijiki is somewhere in the middle, while dulse, nori, kelp, and kombu have stronger flavors. Please tread carefully with hijiki, as samples have been found to contain inorganic arsenic (which is very concerning from a health standpoint). I recommend consuming it very sparingly, if at all. And now, let’s talk food! I consider myself an adventurous eater, but other than a few sushi rolls when I go to a Japanese restaurant, I don’t eat much seaweed. Whenever I am at Whole Foods, I see a pretty good-size chunk of one aisle devoted to different kinds of dried seaweed. What are some ways I can eat them? Do they offer any real nutrition benefits or are they healthy just because they are low in calories? Seaweed — which is literally available in thousands of varieties — offers an array of flavors, textures, and health benefits. All varieties are good sources of B vitamins, calcium, copper, iodine, magnesium, manganese, potassium, vitamin A, vitamin C, vitamin K, and zinc. Most varieties also provide substantial amounts of lignans — the compounds found in flaxseed that are linked to decreased cancer risk AND lower LDL (bad) cholesterol levels! 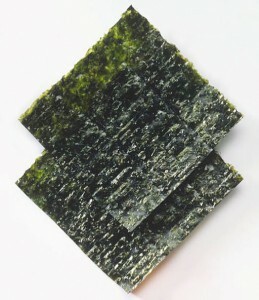 Nori is the most commonly consumed seaweed, as it is the one used in sushi rolls. However, many people also like to add a few slivers of nori to salads and soups. You can even buy sheets of nori and make home-made vegetable rolls. For example, roll up mesclun greens, sliced avocado, sliced mango, and julienned (that’s chef-speak for “thinly sliced”) red peppers in a nori sheet, cut the long roll into round bite-size chunks, drizzle a bit of dressing on top (this peanut-cilantro one complements the flavors fabulously), and you have yourself a fun — and nutritious — lunch! In Japan, toasted nori snacks are immensely popular (almost as much as potato chips are in the United States). Kombu is a type of seaweed mainly used for stocks, while kelp is often added to soups (like miso) or used in granule form to add fishy flavors to vegetarian items that aim to mimic seafood. Arame is used in many savory dishes, including stews and grain-based side dishes, while hijiki is often steamed and consumed as a side dish of its own (one restaurant I frequently establish serves up hijiki as part of a platter alongside brown rice, chickpeas, and stir-fried tofu). Dulse is mainly available as granules to add fishy flavors to food, although whole dried dulse can be eaten right out of the bag as a snack or used as a salad topper. FYI: most seaweed salads at Japanese restaurants use a combination of seaweeds. The downside? They contain a substantial amount of added sugars and oils. If you want to start your meal with it, keep that in mind and make light entree selections. The biggest mistake I come across when it comes to the nutritional aspects of seaweed is the completely erroneous claim that they are a good source of vitamin B12. They are NOT. Seaweed contains B12 analogues — compounds that mimic the vitamin. Vegetarians and vegans need to be very mindful of B12 analogues; they attach to B12 receptors in the body, and prevent real B12 in the diet from being absorbed properly! Also, since seaweed is very high in iodine, anyone with thyroid issues should first consult with a Registered Dietitian before adding it to their diet on a consistent basis.